Would you like to know how people really think their way through all the problems of doing research and writing a book? Watch two old pros in action as they do that in the e-mail correspondence between sociologists Rob Faulkner and Howie Becker as they wrote Do You Know? The Jazz Repertoire in Action. 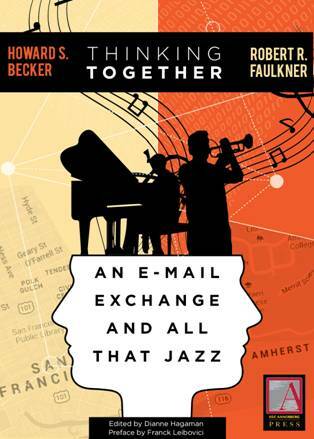 The book Thinking Together: An E-mail Exchange and All that Jazz shows the authors exchanging ideas and modifying them as the conversation proceeds. It shows them extracting ideas from their experiences in the field: performing in public, collaborating with other musicians, interviewing, using their field notes to generate ideas and test them, to elaborate theories as they go, all the thinking that goes on when you actually do research. No review of the literature—it’s replaced by the two of them drawing in work that seems relevant, that gives them something they can use to explain what they’ve seen and heard: using a study of Mexican witchcraft, for instance, to develop a research strategy, and painfully realizing that they have some substantial musical prejudices that they have to turn into a kind of historical sociology. This is the way research really gets done, what you do after you write the research proposal and start working and find out that none of your plans are going to work because things were more complicated than you thought they were. Bonus #1: learn more about the genesis of the controversial 2009 NSF qualitative research report. * A challenge shared among other occupations: airline pilots and crew, medical teams, emergency response groups, improv groups, etc. I heartily recommend you read “Do You Know?” before reading “Thinking Together” — it is one of the richest & coolest reports from the field I’ve ever read. You’ll get insights into all kinds of stuff you never knew you needed to know. Howard – Thanks for the “Do You Know” suggestion. I looked at the excerpt linked. I had no idea that Becker had studied with Tristano, who I’ve heard could be very rigorous and demanding. I’ve recently uploaded an interview with Clinton Sanders about his time studying with Howard Becker on YouTube that you might find interesting. The interview is in relationship to Sanders’ article in Symbolic Interaction. Thanks for posting the interview, Dirk!